On Saturday, April 14, women and girls will gather in Brooklyn, NY, for a special STEM (science, technology, engineering, and mathematics) event. Black Girls Code, or BGC, is partnering with NASA’s Chandra X-ray Observatory to help girls and young women learn how astronomers and computer scientists use data to create images of our Universe in two and three dimensions. Following a connected series of activities, the participants (ages 9-13) will explore coding, 3D modeling, Virtual Reality, and more – all while using real data from NASA telescopes currently in space. Special guest speakers will include Andrea Razzaghi, Astrophysics Deputy Director at NASA HQ and Jessica Harris, an astronomer and education program development officer at the National Radio Astronomical Observatory. This BGC event is the latest in the series of coding outreach programs developed by the Communications and Education group at the Chandra X-ray Center in Cambridge, Mass. The driving force for these efforts is Kimberly Arcand, who brings a computer science background to her role as Chandra’s Visualization lead, and her team of image processors, computer programmers and designers. Chandra has consistently prioritized developing tools for non-experts to interact with and investigate data from Chandra, one of NASA’s “Great Observatories,” along with the Hubble Space Telescope and the Spitzer Space Telescope. While October 31st is obviously known best (at least in the United States) as the day to celebrate Halloween, this year it takes on an extra meaning. Scientists and science communicators have designated October 31, 2017 to be "Dark Matter Day". Dark matter is the mysterious and pervasive substance that constitutes most of the matter in our Universe. Although scientists have made progress in better understanding dark matter, the true nature of this invisible material remains elusive. NASA’s Chandra X-ray Observatory plays an important role in the search to learn about dark matter. For example, in 2006 Chandra’s observations of the Bullet Cluster (officially known as 1E 0657-56) helped provide direct proof for the existence of dark matter, in a violent merger between two galaxy clusters. More recently, astronomers have used Chandra to test one model for dark matter by studying a collection of galaxy clusters. Over 400 female middle and high school students, educators, and technology professionals attended a viewing of Hidden Figures and panel discussion at the Warwick Showcase Cinemas on Friday, March 24, 2017. The event was presented by Tech Collective, Rhode Island's industry association for technology, in partnership with NASA's Chandray X-ray Observatory and Providence P-TECH industry partners. The event included a private screening of the 2017 Oscar winning movie followed by a panel discussion featuring a diverse group of female STEAM professionals in Rhode Island. Last month, I was honored to attend an extraordinary event: the United State of Women Summit convened by the White House. Since the word "summit" means a pinnacle, this couldn’t have been more appropriate for how I viewed this day and the amazing attendees I was able to share it with. The United State of Women Summit brought together leaders in all different professional fields – from politics to entertainment, from science to finance. The common thread among all of the participants, however, was easy to find: everyone there wanted to continue to foster and enhance the opportunities for girls and women in whatever endeavors they may choose to pursue. Read more about "We Got This"
Today we are celebrating the “sweet 16th” birthday not of a person, but of NASA's Chandra X-ray Observatory. On July 23, 1999, Chandra was launched into space aboard the Space Shuttle Columbia and has been working diligently to explore the high-energy Universe ever since. Read more about Chandra’s "Sweet 16"! Hundreds of explorers converged on the campus of Framingham State University in Massachusetts on Saturday, April 25, 2015 to take part in the first annual Science on State Street festival. The family-focused event offered up a variety of interactive STEM-themed learning stations addressing aspects of chemistry, astronomy, biology, engineering, robotics and more, arranged outdoors across the University’s shady upper campus. We estimate between 500 and 600 visitors overall to the event. 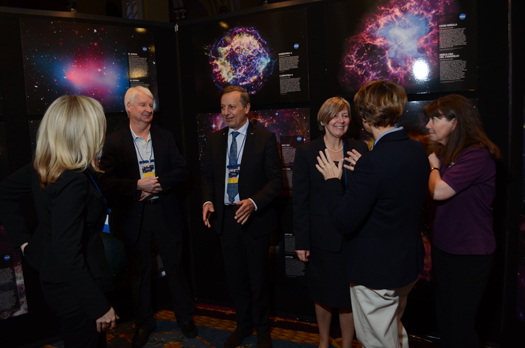 A couple of weeks ago, the "15 Years of Science with Chandra" symposium was held in Boston, Mass. It was foremost a chance to bring scientists together who are doing some of the most fascinating research with Chandra on everything from black holes to neutron stars to dark matter. What are digital stories and how do you tell them? At a recent exhibit at Brown University, that topic was examined in a few different ways. One of the stories shown was a large screen version of images and text selected out of the "From Earth to the Universe" (FETTU) collection. FETTU is a Chandra-led project of astronomical image exhibits that began in the International Year of Astronomy in 2009 but has remained as a legacy project of public science. The location types of the FETTU exhibits have ranged from cafes to malls to metros. Exhibiting FETTU with Brown University's large visualization wall in the Rockefeller library offered a special opportunity to display ultra-large astronomy data sets on a huge screen that lets the viewer not only see details in the images that are hard to see on small screens but also helps the viewer feel somewhat immersed in the image. The science images included Chandra’s composite with Hubble and Spitzer of the galactic center, a recent Solar Dynamics Observatory image of our Sun (shown here), an image of Mount Sharp, Mars from the Curiosity mission, and 5 other objects.